We have some exciting news to share and wish you all a great weekend! 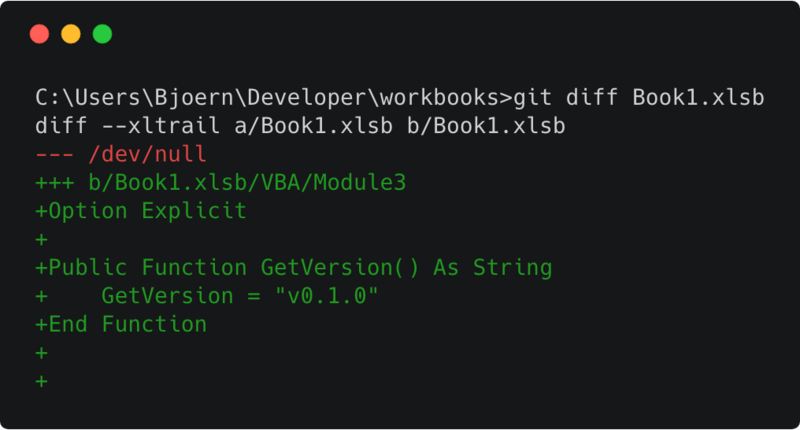 The initial release of our new Git extension git-xltrail allows you amongst other things to do a git diff on your local VBA code. Follow the discussion on HackerNews and listen in to the Microsoft Cloud Show where Andrew and Chris discuss git-xltrail around minute 13:00. Also check out the GitHub repo where we already hit 100 stars! git-xltrail is a great companion to xltrail, our commercial server installation (but works perfectly stand-alone). By far the most popular request from our past live webinars was the ability to get access to the recordings. We are happy to offer you now a comprehensive on-demand course: At the moment, it consists of a set of beginner and advanced tutorials, with an introduction for the absolute beginner to ship around the typical starter issues that we see every other day on either GitHub issues or StackOverflow. The tutorials are split into short videos (usually between 5 and 10 minutes) so that it is easy to quickly find the topics of interest. The course material comes in the form of Jupyter notebooks and is available for download. There are free preview videos available from almost all sections, so make sure to check out the class curriculum! xltrail 1.5.1: xltrail now properly supports Git branches.